It’s fantastic. I’ve never been able to do a bun in my hair before I found this product. I especially love it for the office, because a) it looks professional (this is especially important as I am the youngest employee in the office, and one of only a few female attorneys) b) takes only a few minutes to do; and c) means I don’t have to blow dry and straighten my hair every day. 2018 Update: We’re adding these clips to our Workwear Hall of Fame because after they are still around and getting rave reviews. Amazon has them, but obviously also keep an eye out at your local drugstore. I am excited to read the responses of others. I saw these in the drugstore yesterday and remembered a few of you have mentioned them, but was unsure how to use them. Is it really fool-proof? Yes they are! I use two. I have thick, way hair below my shoulders. I love that it doesn’t leave bumps. I have very straight, thick, silky hair and these do not work at all in my hair. I have thick wavy hair to about the middle of my back and they do not work that well for me. Strands are constantly coming loose and the bun usually unravels in an hour or two. Admittedly, the first time I tried them, it seemed to work better. Maybe I am just missing a step now that I’ve thrown away the instructions? Do you first roll your hair and knot it? I am not sure how to explain this better. I put both pins opposite to each other, so that they form a sort of an X.
I do this too, and it works great. Sometimes I don’t get it right the first time, so I just take them out and try again. I bought them based on the initial recommendation on Corporette, and they are my go-to now for buns. I can do a neat profesional one for court, or a somewhat looser, messier on for the weekend/after hours. I do knot it as best I can. I don’t secure the hair with an elastic though. Should I? I think my problem is more that it doesn’t stay. Although I have noticed that the hair tends to be more secure if it’s lower, at the nape. Maybe it’s a matter of finding the sweet? How high or low do you guys keep your bun? I have very thick, wavy hair. The pins work wonders for me when my hair is long enough that all layers can be thoroughly incorporated into a bun. I can get the bun to hold with only one spin pin! But… I must put the bun in when my hair is damp, and mousse or gel always helps. When my hair is long, I do this look regularly, so much so that I’ve started working on mixing it up by using the same pins for a side bun or french twist (so far, not fully successful on either, but I’m getting there). I don’t have luck getting the pins to hold when my layers are a bit shorter (there is no way to tame all the short pieces that inevitably stick out), or when I try to put my hair up dry. There’s also the Goody Modern Updo Maker for french twists. I have that same fine, straight Asian hair as mentioned by KL, about 3″ pass my shoulder and the updo maker tucks everything away nicely in a clean, chic french twist. It did take me a little bit of practice to find the happy medium between painfully pulling my hair back and being so loose that I had fly-aways and the updo sagged a bit. This is all with dry hair, so maybe the updo maker would work well for you, too, Margaret. I think it’s large enough for thicker hair as it was barely concealed by my fine-texture hair. Ok, so I ran out and bought some based on these recommendations, and I’m sad to report they don’t work for my hair!!! I have long, super straight, fine hair and the bun just pops out with the pins in. Ugh- so frustrated!! That is so odd. 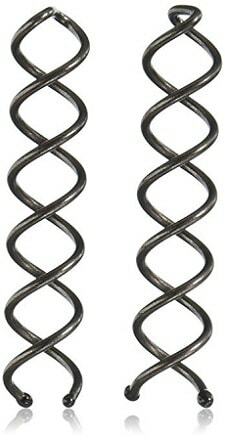 I have long fine thin straight hair and these are the only thing that have ever held my hair in a bun!! Did you try it when your hair was wet? That helps. And I have certainly taken them out and redone my hair after a few hours. The Goody hair thing for putting your hair into a French twist would not stay in my hair at all. And I haven’t tried the thing that looks like a flattened spring coil for holding hair in buns. But maybe one of those would work for you? I have baby fine hair and find that the pins work best with wet hair. I also find the smaller spin pins better for the weight of my hair. It takes a little practice. I know I’m late to the party here, but these don’t work for me at all. I have thick, long hair. First, they don’t feel that secure. Second, they don’t fasten all of your hair, so clumps of my hair stick out at odd angles. I was very disappointed, because I wanted them to work so badly! Ditto this. I got the one that looks like a coil, and the idea is you are supposed to twist your hair into a bun and then “spin” the coil onto the bun to keep it in place. I have coarse, thick hair Middle Eastern hair and it doesn’t fit on my bun no matter how tightly I wind it. Hair care products I DO recommend: CHI Silk Infusion and the Rusk Speed Freak hairdryer. Ever since these came into my life, I have been frizz-free. I’ve been meaning to try these for a while, although I’m not really a novice at neat bun updos. (I have low-maintenance straight Asian hair that is waist-length and has been at least bra-strap-length for many, many years.) My go-to hairpins are Sally’s Beauty Supply Roller Pins–they come in a distinctive black slider case. I can hold up a bun all day with two pins (and no hair tie). I’ve got the same hair as you, KL, but my hair is very heavy (for lack of a better description) and ALWAYS just wants to hang straight down. Buns tend to just flop out after I move my head a few times. Do you think the Sally pins will work for me? Definitely give them a try! I could never put my hair up with regular bobby pins. My hair isn’t as thick as it once was, but it’s definitely not thin or light. It refuses to hold a curl and I’ve only found one hair-elastic bun that works (half the time, depending on how stretched out the elastic is). Make sure you get the Sally ROLLER pins–sometimes also called hat pins, though their label is roller–they should look giant and thick, because that’s the key. Sticks and forks also work, but I didn’t “graduate” to hair sticks until after I had figured out a standard pinned chignon. If you have time, would you mind posting a link to the tutorial? Or at least list a couple of the fora? Turns out I’d saved the page in Evernote, so here you go! Hope the link works, if not, search for “Easy Hairstick Bun” on the LHC. Hmm, let’s try again with those links. I belong to the Frizz Head Community. “Our” forum is a NaturallyCurly.com. :-) (Very informative site). likewise, someone tell me if these work or not! and related, has anyone tried Ficcare hair clips and related styles? reviews? do they really do the trick? they’re $35-40 each …. I have tried a few. For reference, my hair is long, fine, & smooth, and I have two problems with them: (1) they’re heavy, so they tend to slide out of my hair (or give me a headache by the end of the day from all that sagging/pulling) and (2) I’m right between sizes; the small is too small for all my hair, but the large has too much room (see (1) above). I think they’re lovely looking, though. Sorry for that intensely lawyerly response. I loved them when I had long (below shoulder) length hair. My hair if fine, straight and very thick (i.e., I have lots of tiny little hairs), and the medium worked perfectly for me, both on days when I didn’t feel like doing my hair and on days when I wore my hair down but wanted it out of my face by the middle of the day. I would basically pull my hair into a low ponytail (but not put in an elastic band), and twist. Probably not the best looking style ever, but I’m generally incompetent with hair. I love the spin pins! They hold well and don’t fall out during the day, and look much more professional than a bun held by a hair elastic (or the classic 4 PM ponytail). The only problem is that they tend to slip out of pockets and off whatever you’ve twisted them on to in your purse, so they’re a bit easy to lose. In Canada I looked for ages and finally found them at Loblaws — they now have both the packages (the longer ones and the 3 shorter ones). I’ve also seen them at Icing. In Western Canada you can also find them at London Drugs. Does Loblaws have a law blog? Do you recall the Bob Loblaw character from Arrested Development? (Scott Baio). Ah, Arrested Development, we hardly knew ye. Just went back and YouTubed his TV ad. Don’t speak nonsense to Bob Loblaw! Are you referring to a different brand? As far as I know, the Goody product comes in one size only. I once saw some in different sizes on ebay that I believe had been made in Asia. Goody now makes wee-er ones. I have a pack of the full-sized (2 per package) and just picked up a pack of minis (3 per package) since I just cut my hair and I was worried the full-size ones would show. I have these. I’ve used them once and now they lay on my shelf collecting dust. Pretty much the spin pins can be put in easily enough but they unravel just as easily and then get knotted into your hair. I can achieve almost the same look with a hairband which would probably hold longer (although it’s easier to get the wispy strands sticking out easier with the pins). Hope that helps! I somehow managed to get ahold of a cheap knockoff of these, and for me, they are only OK. My hair is a few inches below my shoulders, but has a lot of layers, which come out of the pins unless I make the bun very high up, which isn’t really the professional look I’m going for. They’re nice for getting the hair out of the way when I’m doing housework, though. I’m curious whether the real things would be better, but I’m not sure how they could be, as simple of a product as they are. I own both the regular spin pins (2-pack) and the mini spin pins (3-pack). I liked the regular spin pins, but I found that they were a little too big for my hair length and texture — just below shoulder-length, very soft (doesn’t hold curl)– so big, that the ends stuck out of my bun. Seems like the regular ones would be great for people with longer or more textured hair. The mini spin pins have worked much better for me and hold either all of my hair in a bun (using 2) or hold half of my hair up (using 1) with no styling product required. A heads up for ladies with light-colored hair: I have only ever seen the “dark hair” (dark brown) color at stores I’ve visited (Walgreens, CVS, Walmart). You might have to order the light-colored ones online. These are by far my best friend for my hair. Yes, they are fool proof. Just be careful not to interlock the two (or three) pieces. I have long, thick curly hair and I love these! It makes it so easy to put my hair up in a bun. However, it works so much better if my hair is wet. Agreed — these work amazingly well for me, I have curly but fine hair, just below shoulder length, and these keep it secured in place all day! Love! I’ll second SG that I’ve had to switch to the mini-spin pins because of my hair (about 2 in. below my shoulder, lots of layers, straight and thick). They do work really well to keep my hair in a bun, but I don’t have enough hair to “cover up” the longer ones. FYI, I have medium-blonde/light brown hair and I’ve used the darker ones with no problems. They really are fool proof, though – I thought I’d have to practice, but they were easy to use right away! And they definitely kept my hair up! I have very fine hair that is slightly wavy and shoulder length. These won’t stay in my hair if it is clean. I recently discovered the sock bun method and am never going back to pinned buns. It looks great, stays put, and is easy. For a tutorial, see this video – http://www.youtube.com/watch?v=I13J7ArHTkM. This is brilliant! I’m growing my hair out, not long enough for this yet, but it will be my go-to once it is. I love sock buns! I have enough hair to not need the actual sock anymore, but I think it makes such a smooth, neat bun! I have below shoulder length layered hair. Spin pins have been a game changer for me. My hair only needs two and it creates such a good grip- I once went jogging with them in my hair (by accident) and the bun still held. Love them. Works perfectly for my long straight Asian hair. Even better? The knockoffs are 5 for a dollar on eBay. I have a lot of hair (my stylist says it is fine but there is a lot of it) that falls a few inches past my shoulders. I love these. It took a bit of practice at first, but I use them at least once a week now. The thing that made them easier for me was to use an elastic band to secure a ponytail first and then make the bun. It anchors it a bit and you can’t see the band in my hair. It is possible for me to do it without, but its more difficult and not quite as sleek. Yes, I have fine hair too and for the life of me I don’t know how people manage to do buns that stay in *without* making a proper ponytail first. I put in a ponytail with an elastic band and then use two spin pins in an “x”, and it works like magic and lasts all day. Today’s the last day of the Brooks Bros. sale, and I picked up this dress recently that I wanted to recommend. It’s very well made, 100% wool but somehow perfect for summer (I have worn it on 90 degree days and been as comfortable as one can be on a 90 degree day in a black dress), it’s lined, incredibly flattering, and the perfect length on 5’4 me (right at the bottom/mid knee, not short as in the picture). It’s a perfect year round work dress, imo, and esp. great for summer. Only hitch is it runs a size large. Definitely size down. The picture does not do it justice. It looks great alone or with a belt. I know – the wool seersucker is weird!! I actually didn’t realize it was wool when I first tried it on, and I worried about whether it would be a summer only item before buying it. As it is, it still feels ‘summery’ to me, but I think it will be just fine with tights and a cashmere cardigan for fall/winter. I gained a couple of lbs. over the winter, which, unfortunately, I have yet to lose, and this dress is one if the few additions to my wardrobe that doesn’t make me constantly think about those extra 5 lbs. I highly recommend. Spin Pins work for me BUT they don’t look great due to the texture of my hair – my bun doesn’t look thick and even to me. I bought a spongy donut hair accessory (not sure what else to call it) at Sally Beauty Supply for about $5-6 and love it. Same idea as the sock bun. Great for those hot days where the thought of using a straight/ curling iron is repulsive. Note that the spin pins tend to puzzle the folks working the x-ray machines at security checkpoints. I’ve had to explain them several times at the courthouse when I’ve forgotten to take them out of my purse. I wonder if the Spin Pins are large enough to set off the metal detector..having to undo your hair in line to remove all metal objects would be a hassle. They don’t, at least in my experiences at airports and businesses. Ugh, they do, in my experience at the Nashville airport on the way out of town for a job interview. Led to my very first pat-down. Thanks, TSA. I think this is the first time someone has brought this up, but I would love to hear others’ thoughts on how this affects the way you dress. I have to go in and out of government buildings all the time, and I try to minimize the security checkpoint hassle. For my bag– I do not carry my purse into court/government buildings because I don’t want to have to think each time and take out any suspicious/banned items. I just take my essentials and put them in my briefcase, which only has files and pens in it otherwise. For clothes– I try to find shoes without a large metal shank, because I don’t want to take them off. I also avoid belts and large metal jewelry. I had to abandon some nice copper hair sticks because I would always have to take my hair down if they were in. If the spin pins set off the metal detector, that would be a major problem for me, but if not they seem like a great idea. Anyone have tips on how to dress conveniently for frequent security checkpoint passing? No suggestions, but this would probably make an excellent post topic for Kat. Agreed! I hope Kat stores this topic away for her next travel-related post. For airport travel in general I tend to stick to slip-on shoes I can wear with stockings or socks, and leave any jewelry, belt, or watch in my personal item bag until I get through security. These are my tips for airport traveling. I don’t know whether they apply to government building security checkpoints. I wear shoes I can conveniently slip on and off. I wear a top or blouse I am comfortable wearing alone if they make me take off my jacket. I don’t put on my jewelry until after I go through the checkpoint. For this reason, I carry my jewelry pouch in my handbag for every trip. I carry my ziploc bag of toiletries in the same area as my laptop, as they both need to be brought out for the machine. I wear flats (with no shank) way more often than I otherwise would (which is still a lot). The metal in pumps is always setting metal detectors off at the courthouse for me. I also wear much less metal jewelry (previously wore two silver bracelets every day). I go in and out of federal prison to visit clients several times a week and they set the security the highest I’ve ever been through. The days I go I make sure I don’t wear any metal pieces in my hair (even those standard flat clips to wear my hair half up set it off). Have to take off the wedding ring or it sets off the beep. Flats or shoes I can slip on and off (in like closed toe booties with pants) and I try to wear a wireless bra if I remember. It’s kind of insane though. It always seems like the majority of the people going through are male lawyers and they clearly don’t have to think about whether their hair barette will set off the metal detector! I wear a skirt or pants/jeans that I don’t need a belt with. Shirts don’t usually set of metal detectors!!! For shoes I like to wear flats or a simple shoe that I know isn’t metal. I don’t really like to wear jewlery when I know there will be metal detectors. Hope this helps!!! I just bought these today and tried them. They are holding my long, thick hair secure right now. CVS has Goody hair accessories buy one get one free this week. I have slightly-below-shoulder, straight, fine hair that is also thick (I have fine hair but I have a lot of it) and the spin pins are amazing for me. I put them in the morning and by 7pm my bun is still secure and looking good. It seems to help if my hair is slightly wet when I put the pins in. Highly recommend! I’ve seen all the Goody Simple Style hair tools (in the light and dark variations) at Target, too. This weekend I noticed a new item to the line: the Bun Spiral, which resembled a Spin Clip with a larger diameter and closer-together coils. Has anyone used this? Perhaps it’s a good alternative if one’s hair is too long or too thick for the Spin Pins. I bought the Bun Spiral, all excited due to my success with the spin pins, and so far it is a dud for me. Curious as to other people’s experiences, but I seem not to have enough hair for it – ? Maybe I am doing something wrong. It didn’t get great reviews on Amazon. Off-topic: Someone posted the other day, a couple of times I think, looking for clear, lucite necklaces. Just wanted to say that I was in Banana Republic the other day, and they had several with sort of hexigonal beads which looked very nice, for about $40.00. They had one set up on a dummy with both a clear and a purple one, both double looped, and it looked really nice (with a lovely purple dress which I covet), but I couldn’t bring myself to pay $80 (to get both colors together) for what essentially amounts to plastic jewelry. I’ll be on the lookout for sales, though! I saw one in the window of a boutique in Boston this weekend and thought: “Omg, a fellow corporette is looking for this!” The store was called The Beauty Mark. I just bought a package of these this weekend. I like how easy they are to use, and how invisible. But I need more than 2 evidently–they look nice at first but pieces of my long straight fine hair slip out and hang loose after a while. I’m going to buy another package and try that. I put my hair back in a ponytail with a non-slip band, then coiled it up like a cinnamon roll, then twirled in the 2 spin pins. Maybe there is a better way to go? I was in the middle of writing an email to Kat about how much I love these pins when this post popped up. I have a medium amount of fine hair, which almost reaches my shoulders. Usually about an hour after I put it in a bun the bottom “row” of hair slips out, giving me a bun + faux mullet look, which I am not cool enough to rock. The spin pins keep everything in place all day. I love these stupid little things. Would someone explain how to use them? Do you put them in like bobby pins in a regular bun? They are a mystery to me . . . I usually put them in after putting my hair in a ponytail with an elastic. Then I twist my hair into a bun – I do it fairly tightly. I put the first pin in near the end of the hair, making sure to catch both the hair on my head and the hair in the bun, then twist all the way in. I put in the second pin at a 90 degree angle to the first so the pins make an “x” in the bun – again, making sure to catch both the hair on my head and the hair in the bun. Doesn’t work at all for my hair. My hair is past my shoulder, but thin and layered. Half of the spiral sticks out the other end. I really love the spin pin. I have longish (about 3-4″ below my shoulders), fine hair, but a TON of it. I’ve found that the spin pin works great if my hair is wet or dry, but it’s better with a little product either way. I’ve found that the spin pins are great for french twists! I don’t have a ton of hair skill, but it’s not tough to master. I’ve found that they’re not a whole lot better that a simple hair tie for a bun. Houda – Did you see this very timely article that Kat posted a link to on Facebook? Um, here’s the link. Oops! They work really well for curly hair, too. Two women on the Naturally Curly site came up with a “curly bun.” Click on this link and search for the posts by “OperaCurls (#132)” and “redcelticcurls” (#143). They work because instead of crushing hair as do regular pins, they allow curly hair to have three-dimensionality. They’re also far more comfortable than pins. I can’t stand styles that require my hair to be pulled tight. They give me headaches. I use 4 to 6 for a curly bun; 2 for a regular bun. I LOVE my spin pins (wearing them right now, as I do most days!). For me, the key is to make sure i go in close enough to the scalp when twisting in the pin that it catches both the hair in the bun and a bit of the hair that’s flat against my head, if that makes sense. Love them! I have a pair in my gym bag, purse, and desk. They get you out the door quickly, or keep you sane when you need to pull your hair out of your face quickly and professionally. For some it may take some practice, but over all a great product! I have a pair of these and they are super easy to use. I have very fine hair, so buns have always been tricky, but these worked like a charm! I am SO glad you posted this. I was just in the store on my lunch break today trying desperately to find something to do with my hair for my new position. Thanks! For those ladies who said these dont work: ALWAYS tie your hair in a pony tail before you spin your hair in a knot and insert the pins (one on either side as others have suggested). I have very, very thick, coarse hair and when I tie a tight pony and then use the pins I can wear my bun to the gym at the end of the day and it still stays put no problem. 1. These work best on hair when it has not been just washed (aka day 2 hair). 2. When putting the pins into my bun I like to put them opposite of each other (like 11am and 5pm on a clock).